England is at war with Wales. Before Baron Hugh joins his king's army, he begs his sister, Prioress Eleanor, to carry his grant of rents and a private letter to the Hospitaller priory of nuns at Mynchen Buckland in Somerset. Both must be handed only to Prioress Amicia. When Prioress Eleanor, Brother Thomas, and Sister Anne arrive, they discover that Prioress Amicia has been imprisoned, convicted of murder, and awaits sentencing by the Prior of England, the Order's regional head. After reading Baron Hugh's letter, the condemned woman tearfully begs Tyndal's prioress to prove her innocence, claiming she didn't commit the crime. In an unfamiliar place, the murder victim buried, and nothing left at the crime site, what can the trio unearth? Before long, they learn that the victim was generally hated. Several within the nuns' priory and the adjacent monks' commandery, including the woman accused, had reason to kill her. Which one rendered wild justice, and will anyone help reveal the killer when so many welcomed the victim's death? 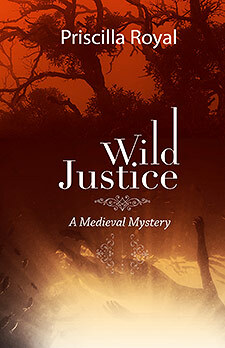 "...Royal's superlative 14th medieval mystery...shows once again why she stands in the front rank of medieval mystery writers." "...a good read for fans of medieval history and anyone interested in problems surprisingly relevant to modern life." "Imagine an Agatha Christie mystery set in late thirteenth century, and you'll have a pretty good picture of this very well executed mystery... Keep 'em coming!"